Penang asam laksa is a popular dish consisting of a savoury broth served with rice noodles, cucumber, pineapple, sliced onion, and shredded fish. It has a unique sour flavour thanks to the tamarind used in the soup base. The dish is also spiced up by chilis and complemented by other herbs like lemongrass and mint, giving it a balanced flavour. I recommend the famous laksa at the Air Itam market, which has decades of business under its belt. 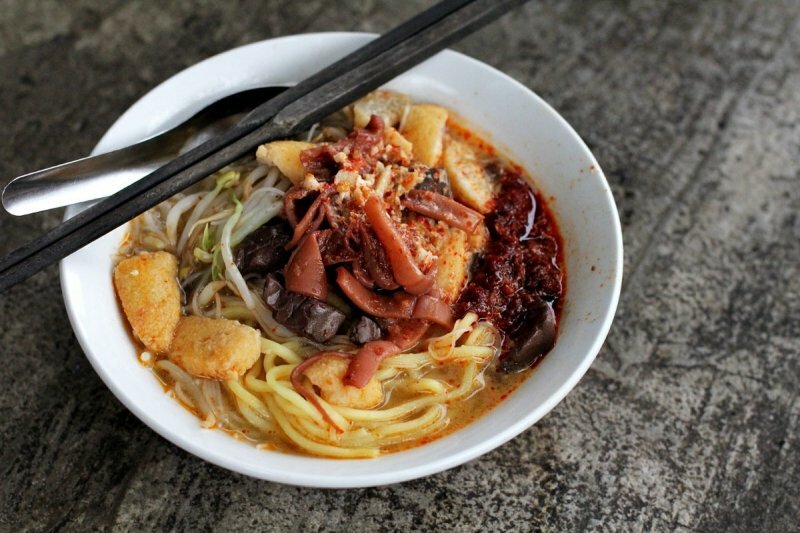 What better place to start your foodie adventure in Penang? Penang curry mee is a coconut milk-based dish consisting of noodles, vermicelli, and other ingredients such as cuttlefish, bean sprouts, and sometimes egg. Because of the coconut milk, the curry in the dish often tastes rich and creamy, promising a hearty affair for any foodie! 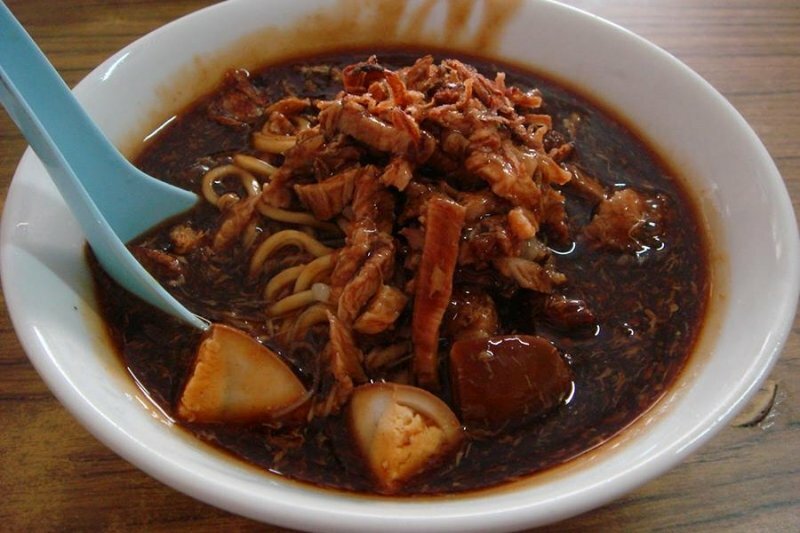 One of the better known curry mee stalls in Penang is Sister Curry Mee (not halal), which has been operated by sisters Lim Kooi Heang and Lim Kooi Lye for a staggering 73 years. It is also located in Air Itam, so if a helping of laksa isn’t enough, you can go for second helpings at Sister Curry Mee! 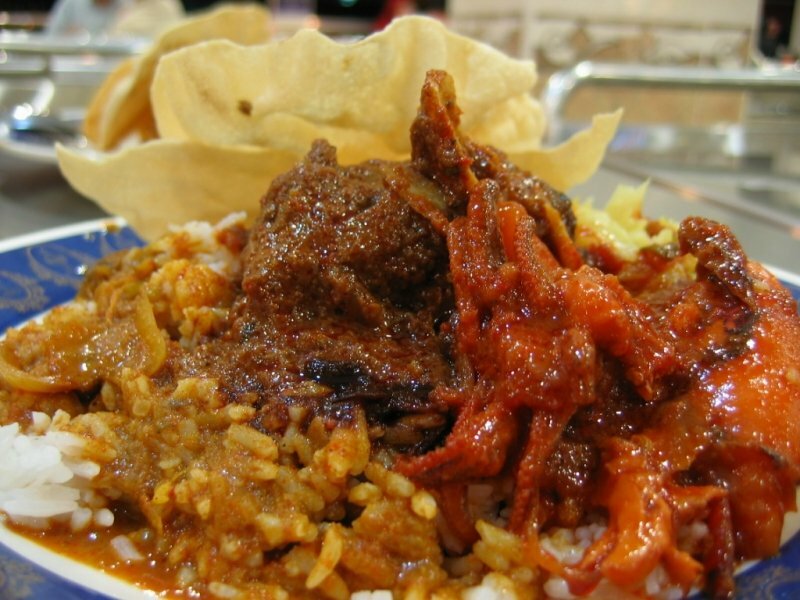 Nasi kandar is a popular northern Malaysian dish of steamed rice with various side dishes. Though but a relatively unassuming shop located at the bottom of a block of low-cost flats in Kampung Melayu, Nasi Kandar Kampung Melayu (certified halal) has a reputation preceding it, and it has drawn foodies from all over Malaysia. Legend has it that they can sell over 1,000 plates on a good day, so be sure to visit early for a taste of their ayam ros and daging masak merah! Though translated literally as “pig intestine noodles”, chee cheong fun is anything but! Instead, it is a delectable dish of silky smooth flat rice noodles served with savoury prawn paste and chili sauce for a bit of a spicy kick. It may sound simple, but the task of blending the ingredients together seamlessly is a complex one which only the most experienced cooks in Penang have mastered. 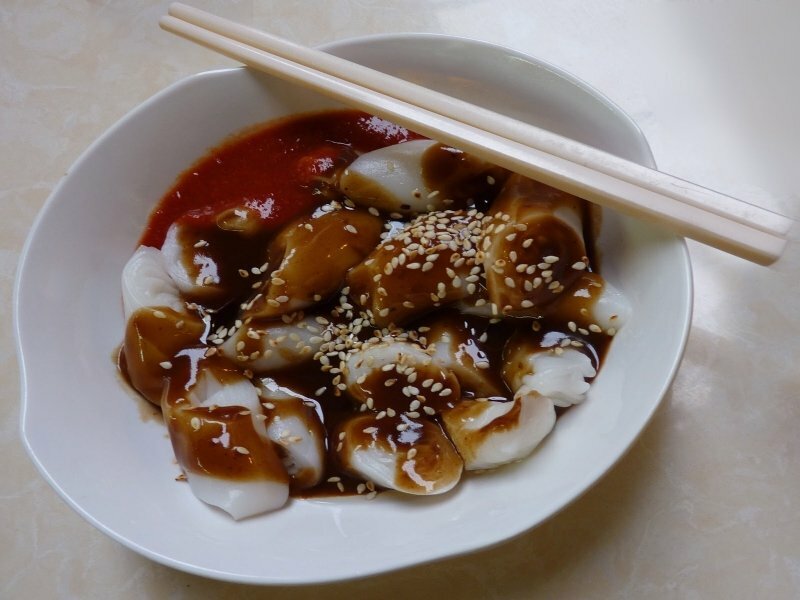 For chee cheong fun with a special touch, check out Genting Cafe in Island Glades. They make their prawn paste with peanut butter which, perhaps because of the original dish’s simplicity, enriches the flavour and heightens the experience even more. Also known as wonton noodles, this dish is either served dry (dressed in oyster sauce) or with soup. Boiled or deep-fried wontons (meat dumplings) accompany it, and it may be topped with char siu (barbeque pork) and a few pieces of choy sum as well. Hong Kee Wan Thun Mee on Campbell Street is known for using the traditional bamboo-pole method to prepare its noodles; on a lucky day, you will get the opportunity to see one of the shop workers knead the dough with a bamboo pole first-hand! Why not try your luck? 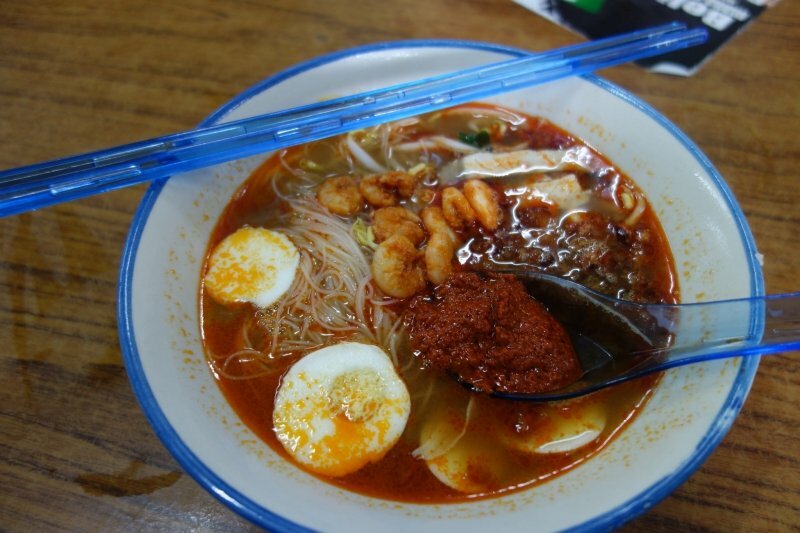 Not to be confused with curry mee, Hokkien mee uses prawns as the main ingredient for its soup base. The dish has an aromatic fragrance thanks to this brilliant method of cooking. Accompanying it are the ubiquitous egg noodles and vermicelli, but also fish cakes, pork or chicken slices, and fried shallots. Yum! 888 Hokkien Mee (not halal) on Lebuh Presgrave is known as one of the best in town. You even get to pick extra toppings if you want! 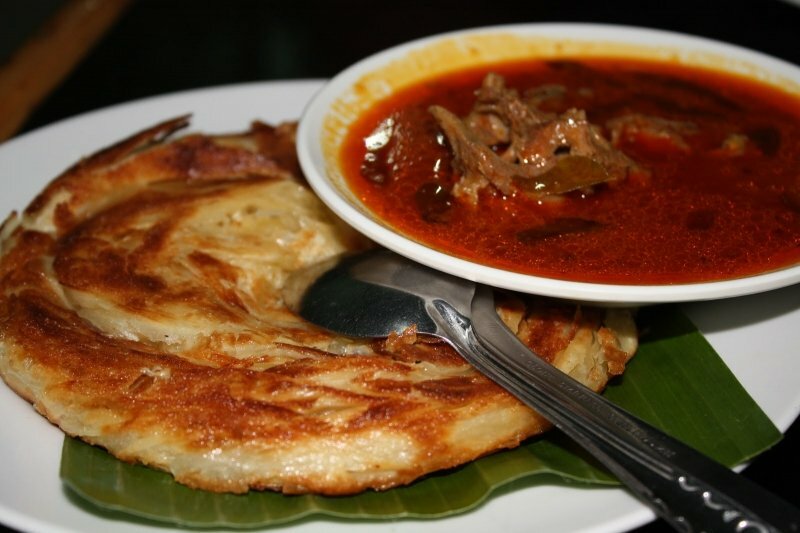 Roti canai is a flatbread dish of Malaysian Indian origin. Usually made plain (kosong), they may also be made with cheese (roti cheese), egg (roti telur), or margarine (roti planta). They are served up with a variety of curries and sauces ranging from lentil curry (dal) to chicken curry (kari ayam) or mutton curry (kari kambing). Roti Canai Transfer Road (pork-free) sells flatbread so good, people are willing to queue up early in the morning just to buy it. They offer diverse types of curries and rotis, so hit them up to see which combinations you like best! Nasi lemak’s name pays homage to the coconut milk used in the process of making it. 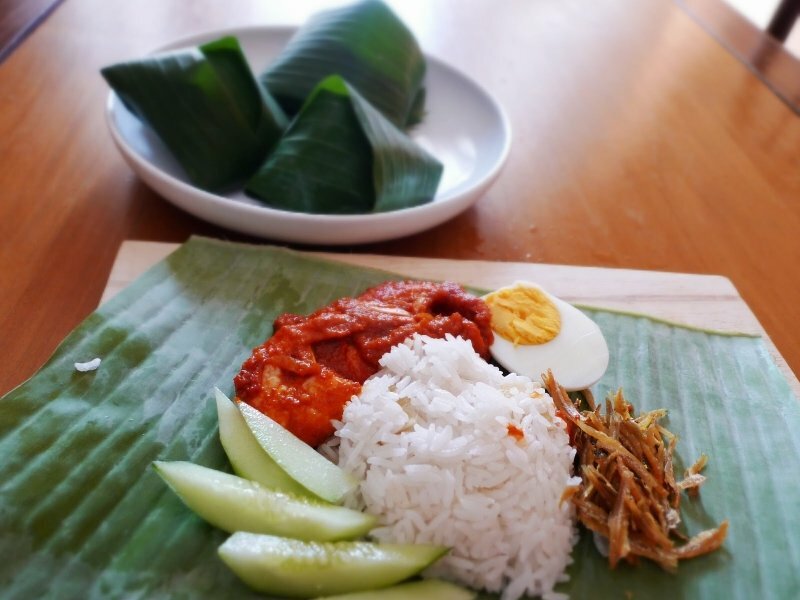 Literally “fatty rice”, nasi lemak is actually rice soaked in coconut milk before being steamed in banana leaf. Although generally served with eggs, peanuts, anchovies, and sambal, if you are hankering for something a little more substantial, nasi lemak is also sometimes sold with fried fish or chicken. This is not a meal for the faint-hearted, but if the calories in a packet of nasi lemak don’t bother you, Ali Nasi Lemak (pork-free) on Beach Street is a great place to satisfy your appetite. It’s renowned for being so scrumptious that you will want more than one packet! 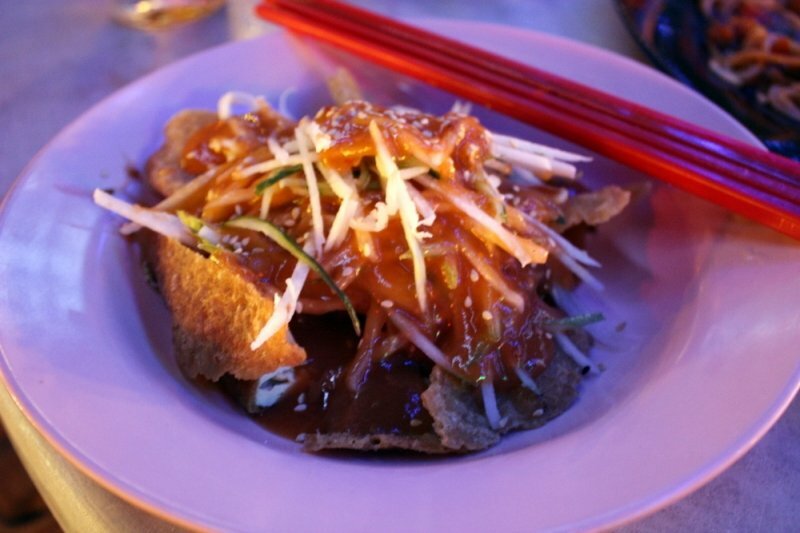 Pasembur is a salad of fritters, bean curd, diced potato, and shredded cucumber. Tossed together, the ingredients are topped with a spicy peanut sauce. In contrast with nasi lemak, it tends to lean towards the healthier side of life. Kareem Pasembur Rojak on Union Street has been operating since 1945 and is famous for their pasembur. Also written as loh mee, this dish is the opposite of Penang Hokkien mee. It has similar ingredients like noodles, vermicelli, and pork or chicken slices, but the thick broth is gooey and the darker in colour due to the inclusion of dark soy sauce. For a spicy kick, chili sauce may be added; for a sour taste, there is always vinegar garlic paste. It is one of my favourites—I find the combination of ingredients to be unique, and the savoury broth is unlike anything I have ever tasted. For a taste of Penang lor mee, try the Hainanese version at Hai Beng Coffee Shop. Its broth is neither too gooey nor too watery, making it the ideal version if your travel companions have different preferences. Penang’s oldest Goddess of Mercy Temple is also right next door and, regardless of your religious affiliations (or lack thereof), its historic architecture still makes it worth a visit. 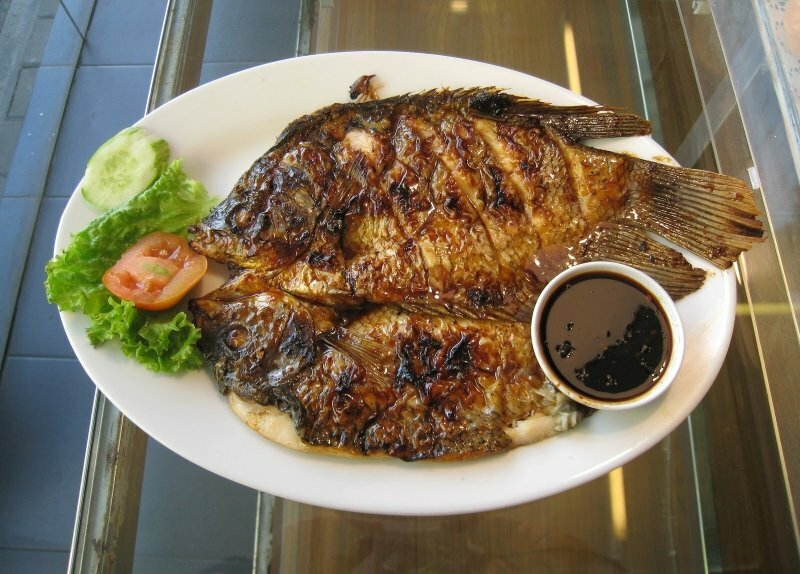 Ikan bakar literally means “burnt fish”, and this dish is as advertised—fish is marinated with spices and grilled over a charcoal grill. The skill lies not only in marinating the fish, but also in the preparation of the sauce dips and side dishes that go with the fish. Many ikan bakar shops in Penang will have vegetables or other seafood dishes that customers can choose to pair with their grilled fish; Restoran Ikan Bakar Din (halal) in Kepala Batas is one of those places. Parking may be a problem if you choose to pop in at lunch hour, so head there early! 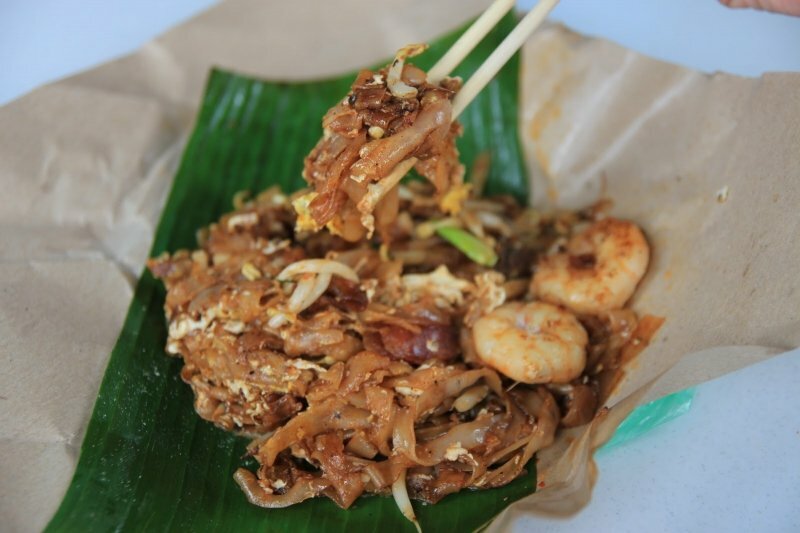 Also called char kuey teow or char kway teow, it is Penang’s most famous dish. 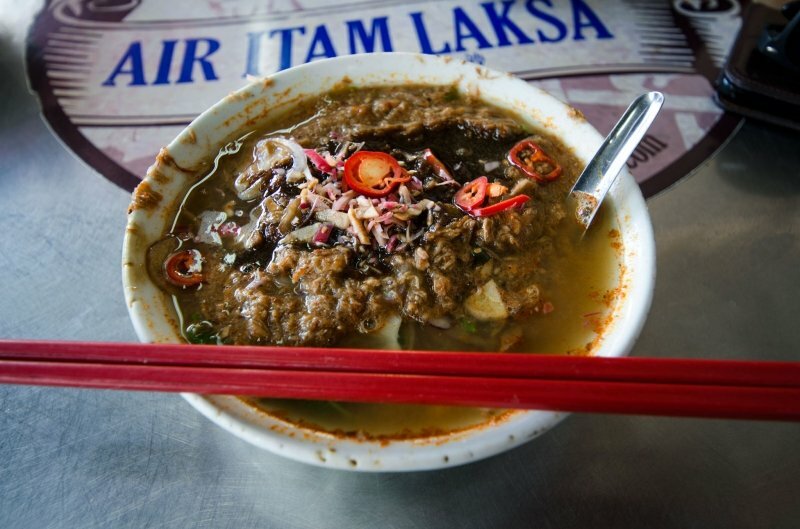 With throngs of foodies coming to Penang each year for this trademark dish, you can see why it’s such a hit amongst locals and tourists alike. You cannot leave Penang without having tried this sumptuous, stir-fried dish with eggs, noodles, and pork-lard croutons. If you aren’t fussy about where you get your fix, simply walk into any food court—nine out of ten will have a char koay teow stall. If you would prefer one of the more famous stalls, Tiger Char Koay Teow (not halal) inside Ping Hooi Cafe on Carnarvon Street is my favourite. It’s time for desserts! Tong sui is the collective term for after-dinner sweet soups created by Cantonese Chinese people. 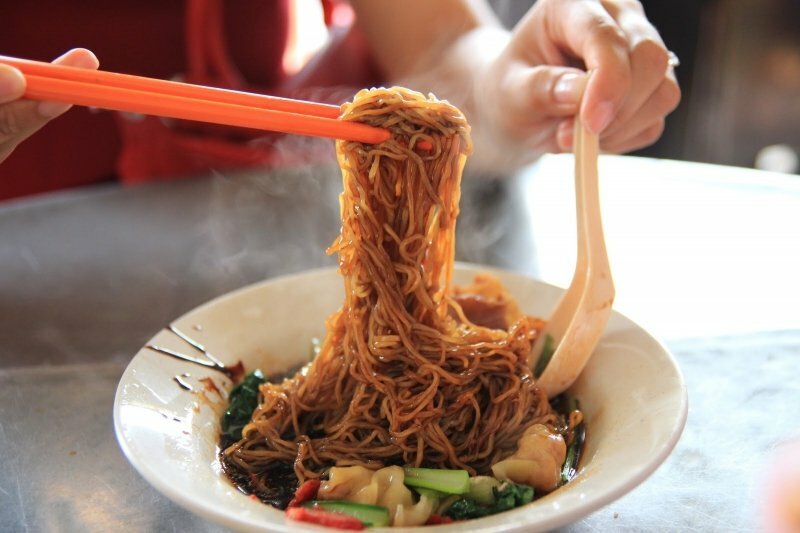 In Penang, the demand for tong sui is so high that sellers have taken to inventing their own. If you have a sweet tooth, Kimberley Street is full of tong sui shops and stalls for you to take your pick. While you’re there, try out Kimberley Street’s duck kway chap, koay teow th’ng, and oh chien as well! 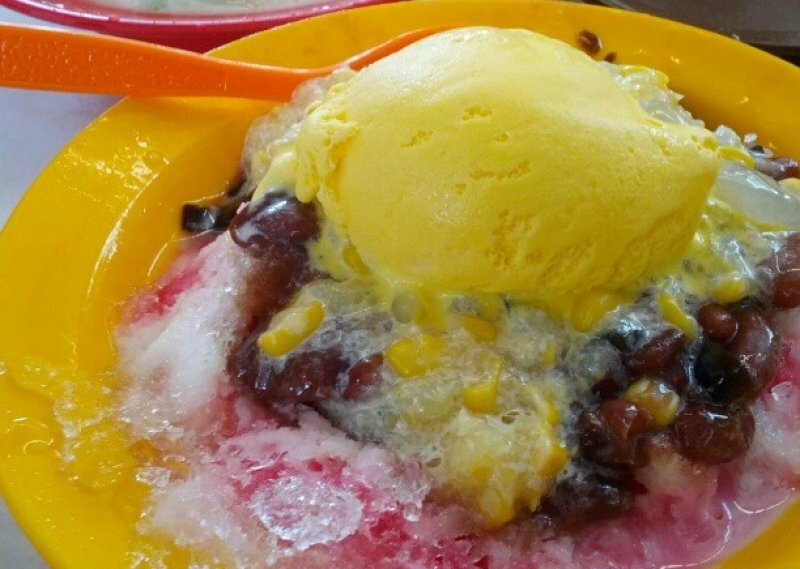 Another one of Penang’s famous desserts is ice kacang, which is shaved ice topped with syrup and other ingredients which can include fruit, grass jelly, ice cream, red beans, and palm tree seeds. 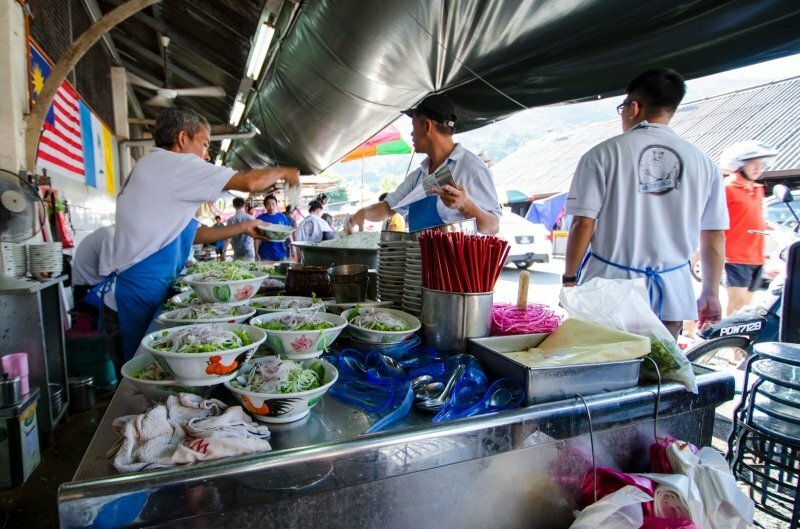 One of the largest ice kacang vendors in Penang is Swatow Lane Ice Kacang (certified halal). It has moved several times since its inception in 1923 and now has a storefront at New World Park on Jalan Burma. While I haven’t been there since the last time it moved, I do have fond memories of it from childhood. The taste, especially! Last but not least is this sweet iced dessert with coconut milk and palm sugar (gula Melaka). 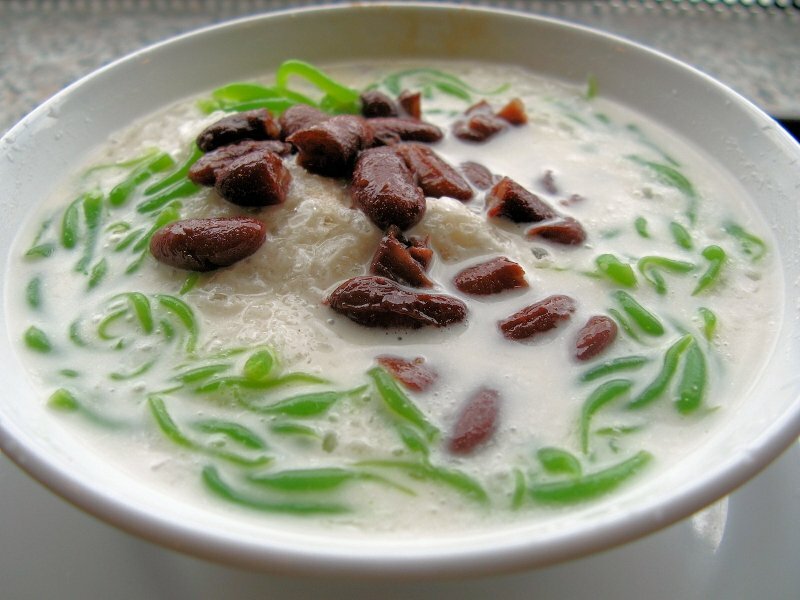 Penang cendol has kidney beans and green flour noodles in it as well, but mileage may vary with the other ingredients. Penang Road Famous Teochew Chendul (pork-free) is so famous that it has branches all over Malaysia, but there is still a sturdy little roadside stall—its humble beginnings—operating on Lebuh Keng Kwee adjoining Penang Road. 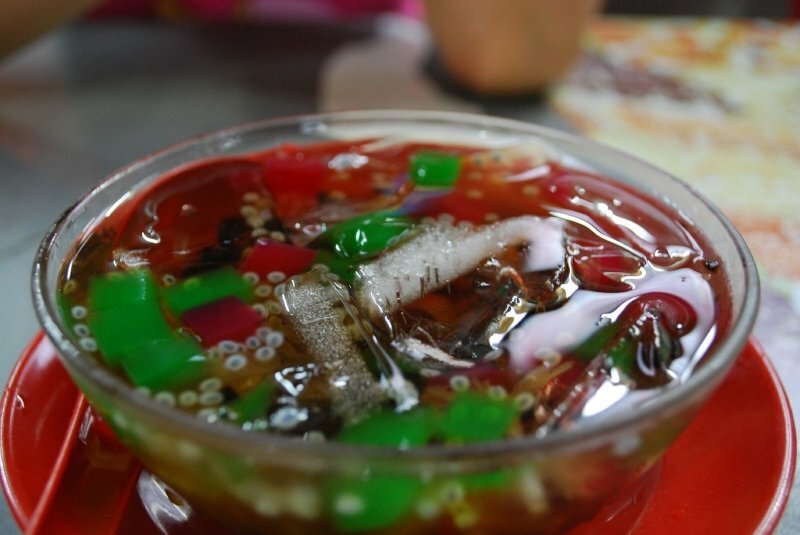 Just imagine a bowl of ice cold cendol on a hot day in Penang. It’s perfect! Halal and not halal; sweet, spicy, or savoury; purely Malaysian or originating from other countries across Asia, Penang has it all. Being the food haven that it is, there is of course plenty more to sample and to discover in Penang. Join me inside this world of food exploration and tradition; I promise you won’t leave dissatisfied! Xinyi loves to read, watch TV, and surf the net. Sometimes, experiencing the world from the comfort of her living room is not enough, and that's when she hits the road. She believes firmly in the power of learning through travel.